Bigger isn’t always better, especially when it comes to planning a NYC wedding! There are tons of wedding venue options in New York City that can accommodate large weddings, from Rooftop wedding venues in Brooklyn to unique wedding venue choices like the Bronx Zoo (there is plenty of space for everyone including the animals!) , there is no shortage of “big” wedding venues to choose from. Luckily for New York couples who have a smaller guest list (under 100 people) there are several inexpensive small wedding venues in NYC as well! 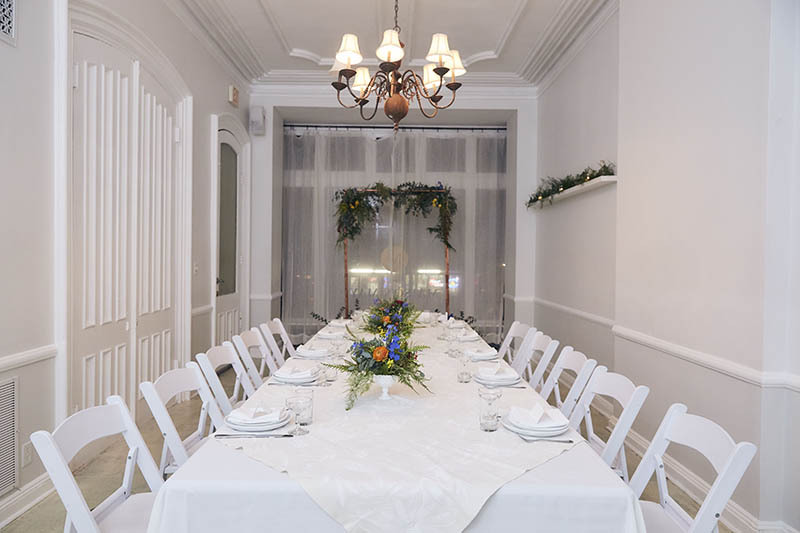 Located in the Fort Greene section of Brooklyn, Maison May (formerly known as ICI) is a converted Brooklyn Brownstone turned french kitchen that specializes in intimate weddings. The small Brooklyn wedding venue recently expanded and now offers two spaces for intimate weddings, Maison May Dekalb and Maison May Vanderbilt! Why we love it: With both indoor and outdoor space available, Maison May is one of our wedding photographers favorite options for an intimate Brooklyn Wedding. 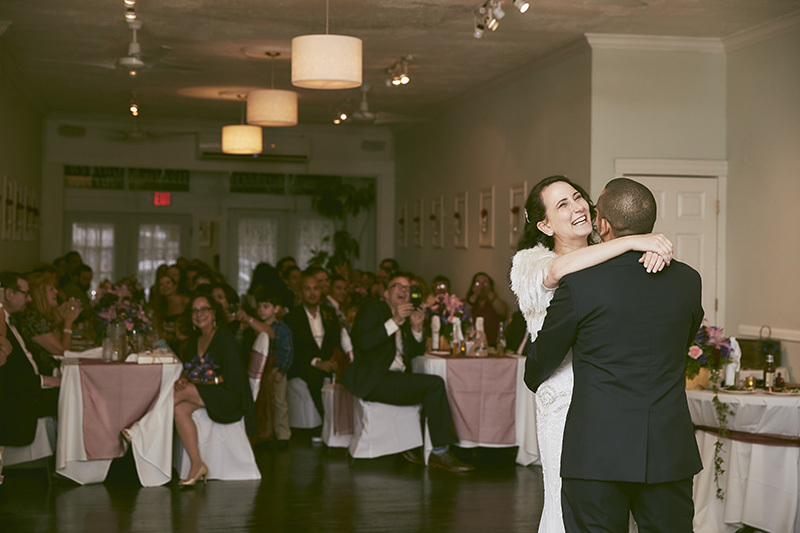 The original (and larger) location, Maison May Dekalb offers a small Parlor floor upstairs that is perfect for NYC elopements and intimate wedding celebrations. The decor is all white and perfect for couples who want an elegant setting for their small wedding. Downstairs the unique Brooklyn wedding venue offers a more rustic décor in their main dining room featuring a fireplace and access to their outdoor garden! Whether your have a guest list of 20 or a gathering of 100 people, this elegant wedding venue can accommodate you. Our wedding photography and video team have been working closely with the owner of this unique Brooklyn wedding venue for years and always capture amazing wedding photos and video at Maison May! Located in the Tribeca section of Manhattan, Locanda Verde restaurant provides delicious Italian cuisine in a rustic setting. 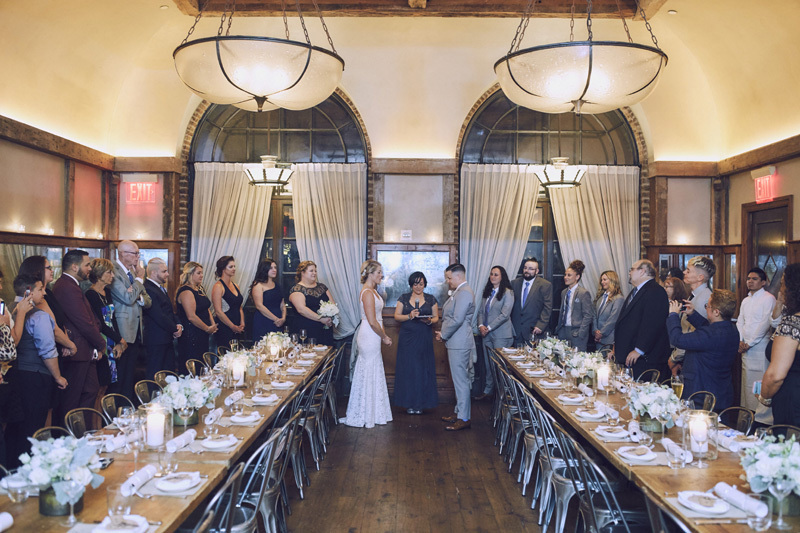 The restaurant wedding venue offers a private dinning room that features a working stone fireplace, brick-lined arched windows and a ceiling made from over 90,000 wine corks! Why we love it: Our NYC wedding planners always recommend Locanda Verde to couples seeking a small wedding venue in NYC! There are many benefits to hosting your wedding at an NYC restaurant including the in-house catering and ability to go a taste the food for yourself before hand! Our wedding photographers have captured beautiful intimate weddings at Locande Verde and creative wedding photos in the area on the cobblestone streets. The affordable Manhattan wedding venue also offers several inexpensive wedding packages. My Kitchen is owned and operated by a husband & wife team that love weddings! With a combined history of over 40 years in the food industry, My Kitchen focuses on providing delicous food in affordable wedding packages. Located in Queens NY, the banquet Hall is easily accessible from other parts of NYC and offers indoor and outdoor space for private events. Why we love it: Another great affordable wedding venue in NYC, My Kitchen is the perfect choice for couples who want a small wedding venue in NYC with indoor and outdoor space. Couples are able to host their ceremony in the garden followed by an intimate reception inside. The staff at My Kitchen work with every couple to create an affordable wedding package in their budget. Our photography and video team have captured several intimate weddings at My Kitchen and look forward to continuing to work at this Queens wedding venue. Casa Belvedere is home to the Italian Cultural Foundation, a nonprofit historic landmark in Staten Island, NY providing education on the Italian culture and programs for the community. The event space offered through the foundation is an elegant reception venue and private dining room with beautiful décor. 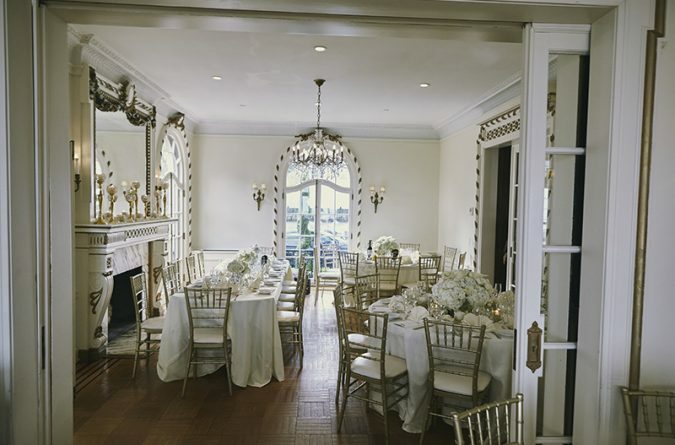 Guest enjoy arched windows, sparkling chandeliers and working fireplace at the intimate venue. 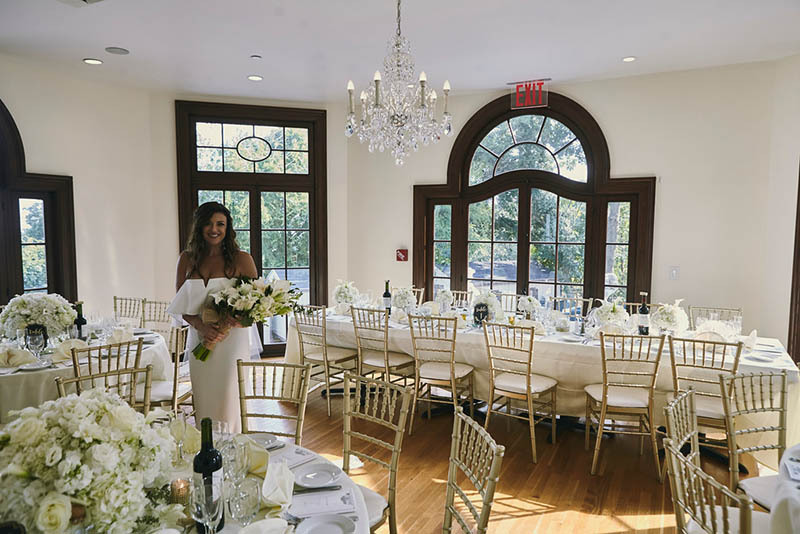 Why we love it: Combining an affordable option for small weddings in NYC, and an educational Cultural Foundation, Casa Belvedere is a great option for intimate Staten Island weddings. Our NYC photographers love working at the unique wedding venue and the space photographs beautifully! Casa Belvedere is also a great option to host your wedding reception after eloping in the nearby Snug Harbor Botanical Garden!